Ready to become a successful government contractor and global business? Join us for the upcoming GovLEADer Series Miami Event on May 10th in Miami, FL at the FIU Graham Center and learn how to grow your business through government contracting. Businesses attending this event will be able to participate in training sessions, business to business, and business to government matchmaking, networking opportunities, and a resource expo with partners from local and national organizations. Learn from industry professionals, local resource partners, and state/local/federal government officials. 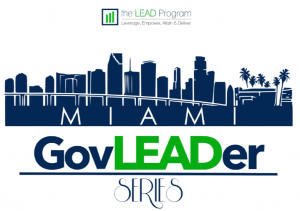 The GovLEADer Series : Miami is a full day event of insightful learning, matchmaking, and mentoring. Interact with the decision makers at our LEAD Connections Matchmaking, receive the advice on next steps during our LEAD Mentoring Round Tables, or sit in one of our Plenary Sessions and absorb a plethora of useful knowledge designed to help your company grow through government contracting and exporting.